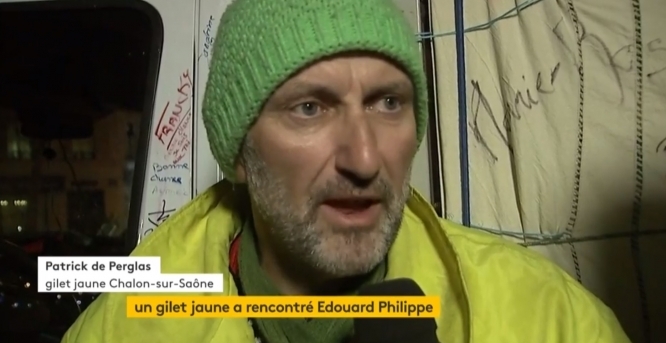 A Gilets Jaunes protester on hunger strike has met Prime Minister Edouard Philippe, and has said that he believes his message “was passed on”, as the movement continues into this weekend. In the latest development of the ongoing Gilets Jaunes fuel protests, Chalon-sur-Saône (Saône-et-Loire) resident Patrick de Perglas has been on hunger strike for 12 days. He has been drinking only water or sugar-free herbal tea. He walked to Paris from his hometown, and had hoped for a meeting with President Emmanuel Macron. Instead, he was seen by Mr Philippe, in a 40-minute meeting that he has dubbed a “success”. Mr de Perglas, a gardener by trade, has said that his hunger strike has left him “very tired”, but that he was pleased to have been heard by the Prime Minister. He said: “He opened his heart, he listened to me with his heart. I looked into his eyes, because for me, the eyes speak more than words. I told him exactly what I thought and that I wanted to say. He added: “[Mr Philippe] told me that he had understood me, [that] he had heard my message, and that he would do what was necessary to pass the message on to the President of the Republic. Mr de Perglas, who calls himself a “pacifist”, also called for new, non-violent Gilets Jaunes demonstrations. He added that “we cannot stop with the Gilets Jaunes movement”. More representatives of Gilets Jaunes protesters are set to be heard at Matignon in Paris today at 14h, by Mr Philippe and minister for Ecological Transition, François de Rugy. Yet, one leader of the movement, Eric Drouet, has said he will not meet any leaders until “the beginning of a new measure” has been announced. President Macron is visiting the Argentine capital of Buenos Aires this week ahead of the G20 summit, but released a statement saying that he “understood the legitimate anger, impatience, and suffering of a part of the public”. He promised “further decisions” on the issue, but ruled out any “U turns or backward moves”. Gilets Jaunes Facebook Groups across France are calling for further protests on the Champs-Elysées this weekend (Saturday December 1), although reports say that only two official protests have been registered with police in Paris; one in Place de la Madeleine, and one at Place de la République. Interior Minister Christophe Castaner has confirmed that vehicle access will be closed on the Champs-Elysées this weekend, although there will be some tightly-controlled pedestrian access.